This blog will provide tips on how to efficiently use today to create your much dreamed about tomorrow, despite your yesterday. LIFE IS IN STAGES ; BLESSINGS ARE IN TIMINGS; OPPORTUNITIES ARE TIED WITH DEADLINES BUT DREAMS ARE BOUNDLESS! Reading about the FISH! PHILOSOPHY has been an eye opener. This Philosophy derived from observing employees of the famous Pike Place Fish Market in Seattle, is endowed with vital practical lessons which I wish to relay to you in simple terms. Life is short as the old saying goes, so I personally believe it has to be enjoyed. We must make the most of every situation and try to make ourselves happy whether at work or not. The employees of Seattle's Pike Place Fish Market demonstrated this was possible, and showed that a good input would in the long run produce a good output. We are sometimes bombarded with demanding situations, but should we take things easy and let down our hair, life can be so simple and complicated situations can be simplified, with once stressful incidents losing all traces of stress. Whatever you are faced with, be it a difficult subject you are studying, or a needed skill you are struggling to acquire, think of ways of making the task interesting. Compose a song about the situation and sing and dance to it if possible. Laugh at yourself and laugh through your blunders. If it's a difficult person you need to deal with, go easy on yourself by making light of it in your own way. Are you hard up and need to eat something unappealing? Add excitement to a somewhat unpleasant meal by garnishing it to the best of your ability. Once, struggling with a phobia of heights, I needed to use an overhead that just seemed to highlight this phobia. I decided to overcome it. I wore my sunglasses , modelled across singing a tune. Only God knows how wobbly and scared I was - but the end product was that I made it safe and sound to the other side. The fun I added to it helped me to pull through. My fear was no longer my focus. Once you keep your eyes and attention off the difficult and unpleasant bit, you will be able to focus on attaining successful results, with an added benefit of fun - fun as you wish to define it. BE LIGHTHEARTED! HAVE FUN AND ENJOY SOME PLAY!!! You were created to meet a particular need. Once you identify it and pursue it wholeheartedly, your performance will put smiles on faces. We are admonished to diligently do whatever we find ourselves doing . When you focus on making others happy, you will make yourself happy in the process. Forget your own problems for a while and try to solve another person's problem. There is an inner feeling of fulfillment that accompanies one's ability to solve someone's problem or to meet another person's need. Inspire others; be creative; leave good memories for others through your actions. Sow seeds of kindness and you shall reap kind returns. "The flower of kindness will grow. Maybe not now, but it will some day. And in kind that kindness will flow, for kindness grows in this way." Sometimes all we need is for someone to be THERE for us! Most humans crave for attention. We must be attentive and sensitive to the needs of others. Make time for others. Listen to them, try to do their bidding to the best of your ability and capability. Try and make people feel good, serve them as though they were royals even if they are peasants. Make the most of the now, tomorrow is not guaranteed for anyone! There may never be another opportunity to make someone feel loved. Add a special uncommon touch to common everyday fare. The good thing about attitude is that everyone has the will power to choose which attitude to adapt. It all begins in the mind and permeates our actions, affecting the results we produce. At the Pike Place Fish Market for instance, the positive attitude of cheerfulness and attentiveness to customer needs produced great sales results, leaving both customers and employees of the Fish Market satisfied. Please choose to go fishing - embrace the FISH! PHILOSOPHY today! As you can see from the narrative picture below, the sour grapes attitude sulks. It is a nasty attitude that must be eschewed and not nurtured. The idiomatic meaning of sour grapes is to decide that the attainment of something you have desired or unsuccessfully attempted to acquire or attain, is not worth it after all , and even possibly inferior in quality. Sour grapes is an attitude that constantly puts down or expresses a feigned disdain about everything that is desired but not attained. A person with a sour grapes attitude will deny the desirability of anything she cannot have. 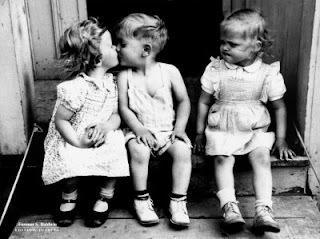 If you wear a nice dress which she wishes she could also have but is unable to buy, she will say all sorts of unpleasant things about the dress for you to feel it is actually not a nice one. 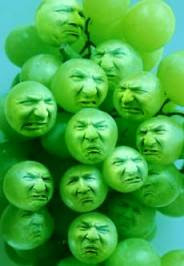 The term sour grapes is derived from one of Aesop's fables . A fox tries many times to pluck some grapes that dangle invitingly over his head, but he cannot reach them. 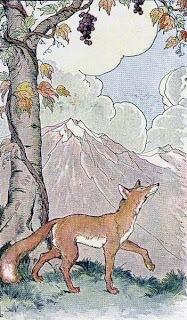 As he slinks away in disgust, he says, “Those grapes are probably sour anyway.” To the fox in the fable, whatever he cannot have is otherwise not good. This indeed is a bitter attitude. To the individual full of sour grapes, what he has tried to attain but was unsuccessful, must not be attained by any other. He will belittle anything he cannot or does not have. Do you always appear bitter about the good achievements of others? Are you fond of passing degrading and cynical remarks about what others have, especially when you secretly wish for the same things? If you simply cannot say 'well done' to your fellow, or admit the admirable and laudable achievements of others. If you are unable to handle your loss in a dignified manner but rather scornfully despise another's triumph, you are full of sour grapes and your attitude sulks. So please, kindly get off your high horse and clean up your envious heart. I like this poem so much and believe it will inspire you. Reflect on the words, and learn from them. DO NOT PLACE YOUR LIFE ON A BALANCING SCALE AGAINST ANOTHER LIFE. IT IS NOT WORTH IT AS YOU ARE UNIQUE IN EVERY WAY! A LIFE WITHOUT A PURPOSE, GOAL , AND PLAN, IS A LIFE SKATING ON VERY THIN ICE. A LIFE MOTIVATOR WHO BELIEVES IN THE INVALUABLE TREASURE EMBEDDED IN EVERY HUMAN BEING, AND STRONGLY ASSOCIATES WITH THE BELIEF THAT - YESTERDAY IS PAST, WHAT YOU DO WITH TODAY IS WHAT WILL DETERMINE A BETTER TOMORROW.